We are close to closing on some office space ending our 2 years as a virtual office. I am absolutely delighted to be honest. I would like to say it was an experiment but it was really necessity born out of being a cash strapped start up. While working from home has its benefits, to grow effectively and work efficiently there is nothing better then being in the same room. It will also be great to have a dedicated work space and a clear differentiation between work and home life. Its been a big focus of mine over the last 6 months to improve work life balance. However when we move we will be keeping all our organisational tools as they are. So here is an over view of what we use. First of all is email of course. Simple, fast and everyone can use it. We have the key accounts, info, support etc. forwarding to a Gmail account for everyone to read. I will show you shortly how the team get access to that. Next is Basecamp from 37Signals. This is our main project management tool and I would be lost without it. It manages our internal projects and those with our clients. Its simple, effective and every client we have thrown it at has picked it up straight away. We have a particular way we structure a project that works for us. Through settings we place all the main project links on the dashboard for easy access. And we categorise message under the following headings. I am lazy when it comes to market research, but it can often be a long term project anyway as you get to know the market you gradually improve your search terms. I have a simple effective trick, set up a few Google alerts for your key search terms and let Google deliver your market research to you. I then use Basecamp for copying and pasting links and notes to build up a full picture of the market. It means that when I hopefully bring on a marketing person in the future I can just direct them to that link on Basecamp. This keeps track of all current features and spec but allow encourages everyone in the project to pitch and record ideas for future versions of the project which hopefully you will be called back for if itâ€™s a client project. All usernames and passwords associated with a project such as server access, ftp, admin, stats tracking, email accounts etc. Similar to Market research I keep an eye out for effective promotion techniques and ideas being used by other companies and I take note of them. Keep an eye on the advertising blogs for this. We use the to-do list for our project plan and split it into point versions containing key features. We then check these off as we work and it gives the team a nice sense of reward and satisfaction often in a long project as new versions are released. This is then linked to the milestones to we can plan specific delivery dates. We donâ€™t tend to use Writeboards much. On Basecamp we have also created a dummy team member with managed access so that we can get a controlled live RSS data feed from it. 37 Signals have integrated their great Campfire chat app into Basecamp. While we love it and could easily use it we actually use Skype instead because we started on that before campfire came about. On Skype we have one shared private discussion between the team that we keep open all the time. Everything is recorded if needed and we can also share files instantly for comment. If things get complicated to discuss over text chat its an easy matter to start a call. Lots of our local and international clients and suppliers also use Skype. For ease of use and cost its an easy choice. For tracking websites we use a combination of 4 tools. Google Analytics of course for detailed analysis, Mint for an instant overview and RSS feeds (its purpose you will see in a minute), Crazy egg for web apps and see where users are clicking on a design and AWStats just to double check stuff and keep an eye for hotlinking. I have tried quite a few accounting packages and for reasons I put down to my own shortcomings I have not been able to get my head around. I seem to have some kind of mental block when ever accounting terms are mentioned. So I created my own. Using Google docs and spreadsheeds I created a simple spreadsheet to record my accounts in with a simple â€œMoney coming inâ€� and â€œMoney going outâ€� and a few simple sums to take that data and split it into monthly in, out and forecasting cashflow. So a simple free online accounts system with from google. It tracks changes, who by and I can simply share them with the accountant when needed. The cashflow is based on Ryan Carsons example. Lastly to tie it all together in an instant one page full overview we use Netvibes. Netvibes is a web app to create a personal webpage. We use it to create a live dashboard for the entire business and websites by the use of RSS feeds. As you can see we have 4 columns covering the 4 main parts of Spoiltchild and the apps. 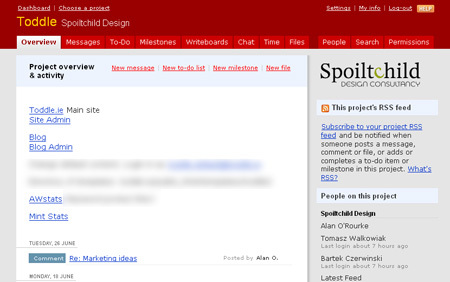 First we use the netvibes gmail widget to pull in the above mentioned emails. Everyone in the team can see when there is a new enquiry or support email and act accordingly. We take in the RSS feed from the dummy team member in Basecamp so we can see any updates happing on projects. Using the RSS feeds from Mint we can instantly see who is talking and linking in to our various websites and what pages are becoming popular. We use another simple web app caled Domain Log Book to track our domain names. This gives us a RSS feed into Netvibes tracking all our registered domains, when registered and are about to expire, the current Google rank and rank in Alexa. For each application we run we have chosen 5 main blogs and 5 main discussion forums who are influential in that market to interact with. We have a second tab in Netvibes where all these are stored and we check in regularly to interact and contribute to and by association promote ourselves. Again we pull in RSS feeds so we can monitor all of these at once. And thatâ€™s it, that is how we manage our projects and sites. Wow! very complicated! I see you’re a real Google user. Google Personalized Home Page (or iGoogle) is a good alternative to netvibes. I suppose it does sound a bit complicated. 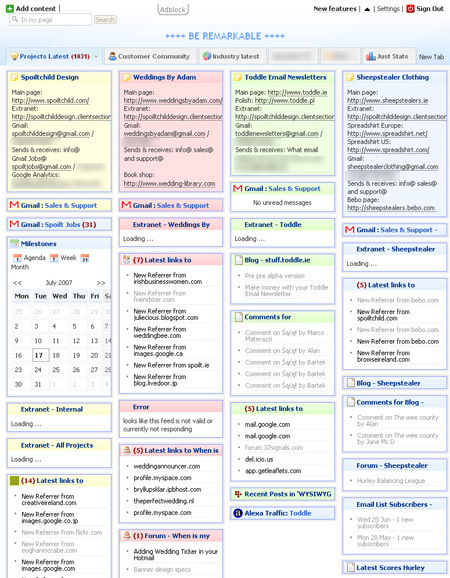 But it all started from Basecamp and email and grew organically from there over a long time. And from a user point of view its simple as they now just check the Netvibes page for all updates. It got Dugg :) Go vote. I am curious to why you don’t like it James? I would be a self confessed evangelist for the app as it made such a difference to me and suits my style of project management however i had not used project management tools before so had no field of reference to compare or previous working style.